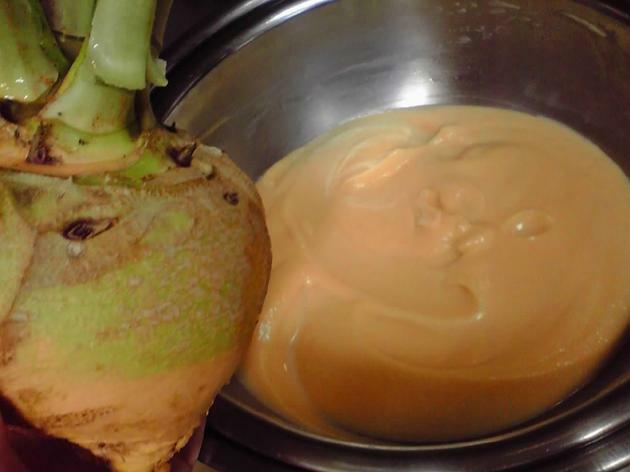 I have noticed a great interest for rutabaga or Swede turnip 8actually comes with many names) and have always been wndering about many recipes. It can be prepared almost in the same way as pumpkins, kabocha and potimarrons. -Peel and cut the rutabaga in cubes. -Peel the carrot and onion and slice. -In a large saucepan, drop the rutabaga, carrot, onion and crushed garlic. -Cover with the milk and water. Add the sugar, salt and pepper. -Bring to boil, reduce fire so to simmer for 40 minutes. -Blend the soup in a blender/food processor. or with an electric mixer. Add the fresh cream and mix. -Serve decorated with a few safran threads and finely chopped chervil. -You may add to this soup cooked chestnuts or fried mushrooms! – You can serve it hot or chilled! 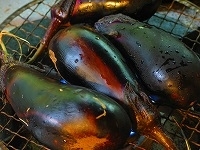 Aubergines or egg plants were introduced from India to Jpan a very long time ago. 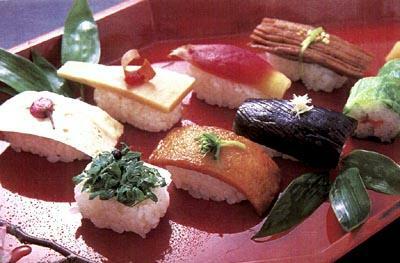 The Japanese since then have adopted them in their gastronomy and lore. Interetingly enough, it has become the symbol of both male virility and utter stupidity! (In Frnce they are a surname given to lady traffic wardens!). 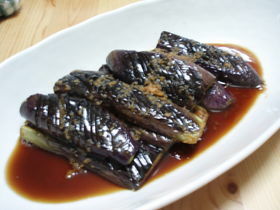 Aubergines are a very versatile vegetable which can be easily cooked/prepared into vegetarian cuisine. Here is a simple recipe reminiscent ofTurkish gastronomy to enjoy as a snack on freshly toasted bread! Egg Plant/Aubergine & Yoghurt Paste! -Grill the egg plants/aubergines directly over the flame on a grill. Doing it in the ovenis fine, too. 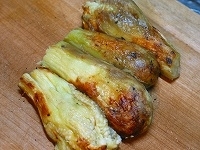 -Oce the the egg plnats/aubergines have been evenly grilled and become soft inside, peel them completely. -Mash them finely with a knife. Do not use a food processor as the the egg plants/aubergines will become a messy juice! -Pour the mashed egg plants/aubergines in a large bowl. Add grated garlic, olive oil and yoghurt. Season with lemon juice, salt and spices (optional). Check taste and rectify if needed. The taste might a bit bland to some, so season it to your preferences. You may add some parmegiano cheese for example. In Turkey they don’t always include garlic. Actually recipes vary greatly in that country. The Japanese will sometimes add sesame oil. Nuts paste or ground sesame seeds are also a great alternative! Enjoy it on your favourite toasted bread! “Agedashidofu” or (Tofu first deep-fried, then served with dashi soup” is a very popular Japanese dish that can easily be adapted to fit vegetarian and vegan priorities! Moreover, whatever dashi/soup is left can be poured onto a bowl of freshly staemed rice for a fillingand healthy suppelementary dish! -You may add spices of your choice, especially grated ginger and hot chili powder! 1. Pressas much water out the tofu as possible. Cut the tofu into large pieces. Take as much as humidity off their surface by wrapping inside a clean cloth for a while. Mix the flour and cornstarch. Roll the tofu pieces into the flour and cornstarch so as to cover all sides. If you don’t have enough flour/cornstarch, prepare more. Drop in deep-frying oil at 170 degrees. 2. Prepare the dashi soup by heating the konbu dashi with the soy sauce and mirin (and extra spices if wanted). 3. Pour the dashi in individaul dishes. 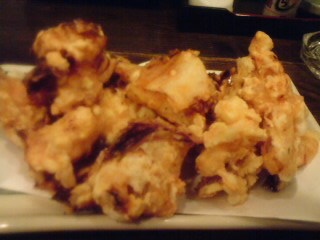 Place fried tofu in the middle. Top tofu with freshly grated daikon and chopped leek. Boil some cut mushrooms in the dashi before serving them together with the tofu! Easy and healthy, isn’t it? Summer is supposedly a good season for slimming and cooking healthy foods. I don’t know about the former and I totally agree with the latter! As this is a season for vegetables, it is also a good time to eat vegetarian now and then! -Cut and keep aside a piece of cucumber 4 cm long. Peel the cucmbers and cut in halves lengthwise. discard the pips and cut again into small pieces.. In a bowl sprinkle them with coarse salt and put them aside for 30 minutes to let lose their water. -Drain the cucumber pieces in a sieve. Mix/process them together with the yoghurt, lightly chopped parsley and olive oil. The soup must be homogeneous. Season with salt and pepper. -Chill inside fridge for at least 3 hours. -Cut the the piece of cucumber into thin slices and keep in the fridge. -Taste the soup and rectify/season it if necessary, before serving it very cold (add a cube of ice in each bowl for decoration and temperature!). Decorate with cucumber slices and parsley leaves. If you find the the soup to thick add some vegetable stock soup/bouillon! 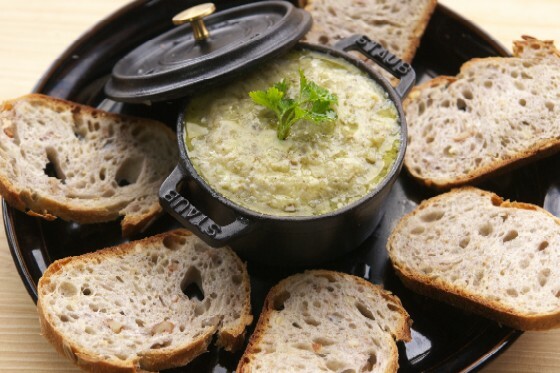 -Serve with an Alsace Muscat or slightly sweet white wine! I’ve said before that the French are also fond of vegetarian and vegan cuisine and are always ready to adapt their traditional rcipes to different priorities. Green Peas & Mint Chutney! -Cook the gree peas (out of their pods!) in a pan full of boiling salted water for 4~5 minutes. Try and preserve some firmness. Cool completely. -At the same time cook the onions in the oive oil for 2~3 minutes, taking car not to “colour” them. Add grated ginger, sugar, lemon juice, salt and pepper. Let simmer for 2~3 minutes. 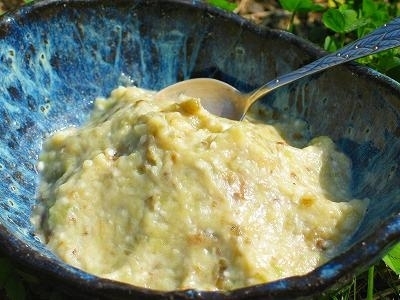 -Mash the green peas (keep some whole for better effect the you will add at the end) and add to the onions. Let simmer for 2^3 more minutes. Lats add the finely cut mint and transfer the chutney into a bowl. Serve cool or slgtly chilled. You can mash all the green peas, but keeping a few whole added with a few mint leaves will look great! Soft Pimentoes or Poivrons in France are eaten from Spring to Fall, especially in the South. Incidentally it is the vegetable richest in Vitamin C.
Bear in mind that the skin and seeds are difficult to digest. Terrine Bayadere de Poivrons/Pimento and Cheese Terrine! 4 deep transparent glasses as shown on picture above. -Wash the pimentoes and grill, one colour at a time, inside a plate under the grill of an oven. Use three plates for grilling. Deglaze each plate with one tablespoon of balsamico vinegar. Sieve the juice one by one into three small bowls or back into their plates, and keep for later process. 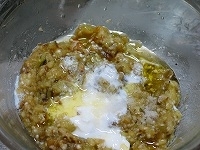 -Mix the cheese with half of the red chili pepper, fine salt and crushed/finely chopped garlic and 30 ml of olive oil. -Peel and take seeds off pimentoes by colour. Process (three different times) into puree with their deglazed juice and some olive oil. Season with red chili pepper and salt each of the purees. -In each glass pour one pimento puree of your choice. Add one layer of cheese, then one layer of another pimento pure, and again one layer of cheese and the final layerof pimento puree. Wrap with cellophane paper and leave in the refrigrerator for 6 hours. -Before serving add chopped leeks or herbs. Serve with a spoon and small toasts of your favourite bread! Dry white wine is best with such a dish! French Cuisine can easily be adapted to vegan priorities and needs. Quinoa is an excellent source of proteins, making it more valuable for vegans! Note: Rinse quinoa just before usng it to eliminate its tartness. Crunchy Quinoa and Seasonal Vegetables in Honey! -Cook quinoa in 700 ml of boiling salted water for 10 minutes. Drain and keep warm. -Peel and clean all the vegetables. Cut the fennel, onions and turnips into small wedges and slice carrots. This is where you can improvise! -Heat 1 large tablespoon of olive oil (EV) in a large frypan (a wok would be best!). First drop the carrots and turnips and fry them on a strong fire for 3 minutes. Add 1 tablespoon of liquid honey and cook on a medium fire for 7 minutes, stirring from time to time. 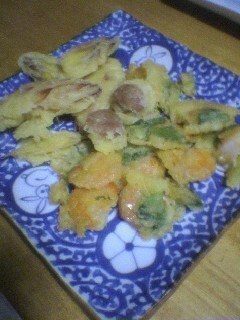 -Transfer the vegetables into a large plate. Wipe the frypan with kitchen paper. Heat 1 large tablespoon of olive oil (EV). When it is hot enough drop in the fennel and the onions and fry over strong fire for 3 minutes. -Add the turnips and carrots with 2 more large tablespoon of honey. Let cook over a medium fire, stirring form time to time for 5 minutes. Add the soy sauce and the last large tablespoon of honey. Fry over a medium fire, stirring from time to time, for 5 more minutes. -Season with pepper and mix. Sprinkle with plenty of fresh coriander. Serve immediately over the crunchy quinoa and eat while it is hot. Simple ane easy, isn’t it? Japanese Vegan Udon, Shiitake and Umeboshi Salad! -In a pan, drop cut dried shiitake, cho@@ed konbu/seaeed and oil. Fry gently. -On a low fire add soy sauce and mirin. -When you are satisfied that the shiitake are soft enough, drop the whole into mixer,nlender. Add water and process unti you obatin a sauce like in the picture. -Boil udon quickly. Cool them under running clear water. Drain throuroughly and place on a dish. 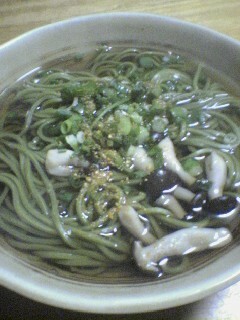 -Arrange lettuce, cucumber on top of udon as on the picture, showing up enough of the udon. -pour the sauce on top and decorate with mini tomatoes. Ume-Shiso Kyuuri/Cucumber, Pickled Plums & Perilla Salad! Ingredients might not be easy to find, although they are probably available on the Internet under various forms. -Wash cucmbers under running clear water and wipe them thoroughly with kitchen paper. -Cut both ends of cucumbers and discard. 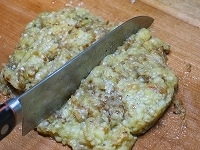 Tight-seal cucumbers inside a vynil pouch and break (instead of cutting) them roughly into bite-sized pieces by hitting them with pestle over a kitchen wooden board. 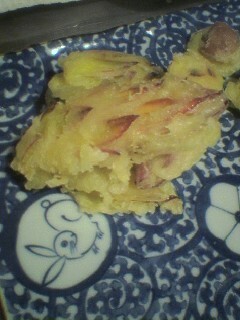 -Discard pip/stone inside umeboshi and cut into small pieces. Cut the shiso into very thin strips. -In a bowl, mix thoroughly by hand cucumber, umeboshi and shiso. Add salt an sesame oil. Stir and serve. Note: Will be very tasty after being chilled inside the fridge. 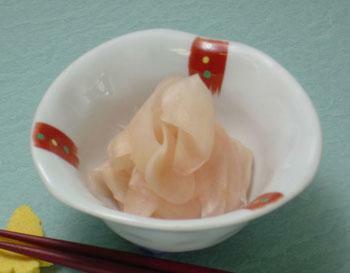 The best umeboshi for this recipe are the sweet ones pickled into honey. Make sure that the cucumber are dry after first washing them or the dish will be running with water. I personally add some sesame seeds for effect and taste! Cucumbers are in season, and the Japanese pickle a lot of them before they become scarce and more expensive! -Cucumber: 1 fairly long. Japanese cucumbers are comparatively thin and crunchy. Be aware that the large soft cucumbers found in “Western” countries might not be appropriate. Moreover, the Japanese eat the cucumbers whole. 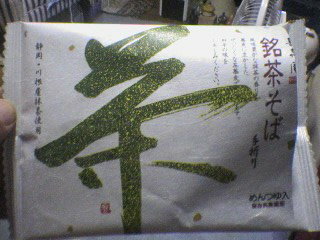 -Salted seaweed (shio konbu): to taste. I personally like quite a lot! -White sesame seeds: to taste. i use quite a good amount myself! -Cut both extremities of the cucumber and discard. Close inside a vynil pouch and strike cucumber with a wooden pestle or the equivalent to break cucumber in uneven pieces. -Take out. Drop cucmber pieces into a bowl. Add salt. Stir with yoyr hand. Let rest for a while. Discard water which has seeped out of the cucumber. Add salted seaweed. Stir the whole gently by hand for a little while. -Transfer onto a dish. Arrange it for presentation. Sprinkle with sesame oil, then sesame seeds. Note: Some people like it without the salt. Washing the cucumber will take acidity out. Breaking the cucumber by beating it will allow other ingredients to penetrate it more efficiently. If you don’t like the breaking method and prefer to cut the cucmber instead, let it rest for 10 minutes before adding the salt. As Lojol rightly said, zucchini is a very versatile vegetable that can be paired with all kinds of other ingredients. Zucchini and Potato Soy Sauce Marinade! -Withe a vegetable peeler, peel small strips of zucchini skin for better pattern. Cut Zucchini into 8 mm thick slices and again across to create “half moons”. Peel skin off potatoes, cut in 8 mm thick slices and clean in clear cold water. -Drain potatoes (don’t wipe them) and put them inside a heat-resistant bow. Cover bowl with cooking cellophane paper. Leave 4~4:30 minutes inside Microwave oven at 500W. -Pour soy sauce and EV oil in another bowl and mix well with an electic whisk. -Heat olive oil in a frying pan and fry zucchini over a fairly fire. 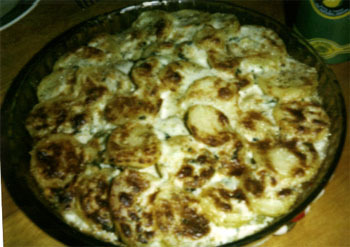 -When the zucchini has aattained a satisfying color on both sides, add potatoes. Fry for 1~2 minutes. Add a little salt (not much needed there) and asome pepper ( a little more might be welcome. Mix and drop everything into the soy sauce-olive oil marinade while it is still hot. -Turn over for time to time until it has completely cooled down. -Serve with a few small tomato slices for better colour presentation! Non-Mayonnaise Avocado and Soy Beans Coleslaw! Cut the cabbage in vey thin strips (chopped). Drop into a large bowl. add a little salt. Mix and little while. As explained above, mince onion, washi in clear cold water and drain thoroughly to take off the onion acidity. Once the cabbage has become softer, mix with onion, cut avocado and lemon juice. Mix the whole, crushing/mashing the avocado in at the same time. Once mixed to you liking, add soy beans and check taste. Rectify if necessary. Note: Put chopped onion inside a stocking-style fined netting piece. Keeping it close with your hand, dip it in cold clear water for a while, then take out and press water out. If you do it stongly enough, no need to waste kitchen paper! Careful about the amount of salt added to the cabbage. Too much and the cabbage will become soggy. If there is too much salt, watch it with clean cold water. The cabbage will taste and feel better if still a little crunchy. Serve inside a half avocado “skin” (keep some sprinkled with a little lemon juice and securely closed inside a Tuperware box in side the fridge until usage). Here is a very simple and basic recipe for a summer snack or starter that should please vegans, vegetarians and omnivores alike: Avocado and watermelon sala! -Cut watermelon in 7~8 mm cubes and sprinkle with lemon juice. Chop shiso/perilla thinly after having rolled them together. Take meat out of avocado and mash it. -In a bowl mix avocado, chopped onion and shiso together. Add salt and soy sauce. Mix well. -On a plate place avocado mix first. decorate with watermelon. Last sprinkle the coarsely ground black pepper on the watermelon. This still leaves you with plenty of leeway for improvisation and variation! Here is another very easy recipe to help you and the “Tofu Tribe” (Terecita, Elin, Jenn and Jennifer modify and preserve tofu for all kinds of usages! I’d like to take the opportunity to apologize to Tinako for my past mistake! If bought dried, let it “come back” in lukewarm water first. If you are worried about the salt, let them rest in water for a while first and drain. -Kawaire daikon, or any fresh sprouts available: To taste. Leave tofu in clean cold water for 30 minutes. Wash and clean wakame seaweed and cut in bite-sized pieces. Cut sprouts in thirds. In bowl mix seaweed, sprouts, ponzu and sesame oil. Drain tofu and cut in bite-sized pieces. Mix in. Place salad in serving bowls and sprinkle white sesame seeds. Note: You can use either kinu tofu or momen tofu. 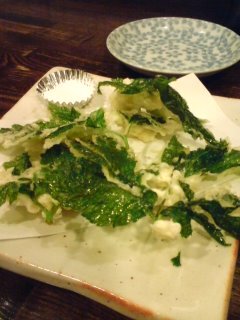 You may use green shiso/perilla leaves vinaigrette instead of ponzu. In summer add cut plum tomatoes. I personally like to add a little sweet umeboshi/pickled Japanese plums! Here is an easy recipe to help you and the “Tofu Tribe” (Terecita, Elin, Jenn and Jennifer modify and preserve tofu for all kind of usages! Take tofu block out of its package and put it kitchen working plank. Sprinkle it with 1 g of salt. Cover with a sheet of kitchen paper. Cover the tofu and its kitchen paper with a plastic Tupperware-type box. Turn box and plank over holding them together. Take off plank and sprinkle the tofu bottom face with 1 g of salt. Close paper kitchen over tofu. Close the box and leave inside refrigerator in the evening. Next morning there should be about 20cc of water having seeped through the kitchen paper. Discard water. Wrap again in new clean kitchen paper. Put back into dry Tupperware-type plastic box and close. Put back into fridge until the next morning. The tofu will have reduced size by half by then. That’s how it would look. Smaller and firmer. More water should have seeped out. Discard it. On a bowl of freshly steamed rice serve with with thinly sliced raw okra, preserved chrysanthemum leaves. Then pour hot tea on top! Pickle it with fresh miso for one night and eat it as a snack! Beautiful in salad with avocado slices! Served with chopped vegetables and garlic chips! Stuffed inside Aburaage with boiled beans then grilled and seasoned with seaweed dashi/stock and ponzu! I was thinking of the “Tofu Tribe” (Terecita, Elin, Jenn and Jennifer) when riding the bu to work this morning. No bicycle these days as we are in the midlle of the rainy season! The day before the Missus had served a quick snack (see pic above) consisting of tofu on which she poured extra virgin olive oil, coarsely ground black pepper and a little salt. Very simple. Not very artistic, I admit, but the idea was there. How about, for example, creating a plate (use a large one with “compartments” for better effect!) with an assortment of tofu pieces seasoned with different varieties of oils, ground peppers and other spices, finely chopped vegetables such as carrots, cucumbers for good colouring. I love my tofu mounted with chopped shiso/perilla leaves, umeboshi/Japanese pickled plums meat and a dash of ponzu! And what about natto/fermented beans with chopped shiso leaves and grated fresh ginger? You could do the same thing with fried tofu, deep-fried tofu and aburaage. 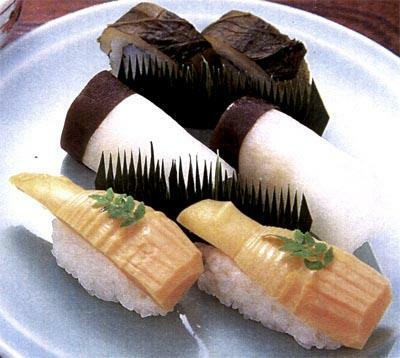 How about a piece of fsh tofu mounted with freshly cut and fried aburaage, wasabi, grated fresh ginger and ponzu? Will be introducing oils in my next posting! Tofu Manju with Ankake Sauce/Tofu Dumplings in Sweet and Sour Sauce! Press water out of tofu. Sift it completely. Boil finely cut carrots and string beans until soft enough. Drain all water. drop tofu and vegetables in a mixing bowl. Mix in cornstarch and salt. Divisde in 4 and make balls. Wrap each individually in cellophane paper. Twist cellophane warap and secure with rubber band or string. Steam for at least 4 minutes. Heat dashi stock, soy sauce, rice vinegar and sugar, stirring all the time. Mix in cornstarch dissolved in water. Serve dumplings on plate and cover them with the sauce! Here is a simple and popular Japanese recipe that can please anyone, vegans, vegetarians and omnivores alike: String Beans and Tofu! 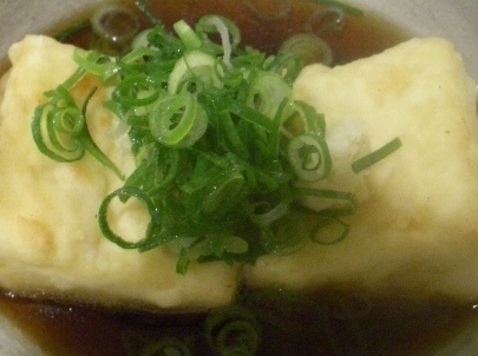 -Drain water form tofu and roughly mix with miso, mirin and sugar. -Peel away strings if any, cut beans into 4cm trunks and boil for 40 seconds. The beans should still be a bit crispy. Drain and let cool. -Drop beans into tofu. Mix roughly with a spoon, cutting the tofu into small bits as in above pic. -Sprinkle with sesame powder before serving. Naturally, this could be one of a whole plate of vegan/vegetarian snacks. One can also add lightly boiled carrots. The combinations are endless! Last Sunday, while visiting my favourite supermarket inside the Shizuoka JR Station in search of unusual vegetables I had the pleasure to re-discover that increasingly popular Japanese vegetable, namely urui. Its Latin name id Hosta Montana. If someone knows the English name, I would be very grateful to be enlightened! 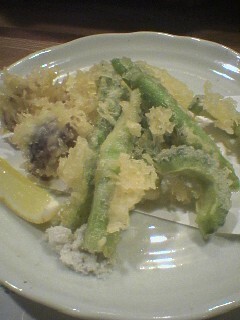 Now, originally this vegetable was a “sansai/wild vegetable” until it has been successfully grown almost all over Japan. The real name of this mountain plant is Oobagibooshi, too long a name to be marketed, hence the “new” name “urui” for the cultivated species. At full maturity it can reach imposing height and width. 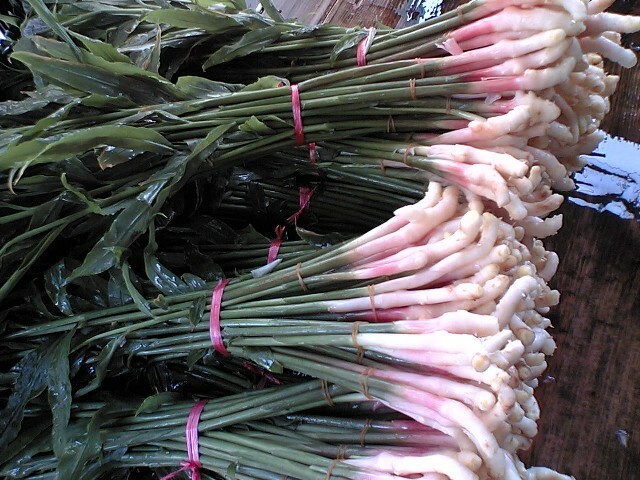 Like asparaguses, it is harvested early before it extends over a foot/30 cm height. The leaves are still small, thin and tender then. 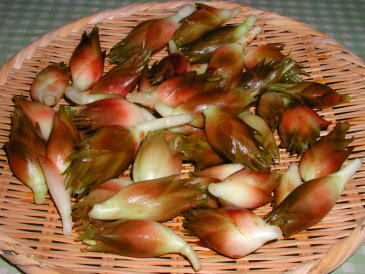 The whole plant, unless cooked as tenpura or fried, needs to be lightly boiled in lightly salted water beforehand. To prepare the plant for the evening snack I had in mind for the Missus (Natasha, Tangled Noodle, do you remember? LOL) I cut the plant into 3 equal lengths and boiled the two bottom ones first as they would take longer. Once boiled to satsifaction I took theme out and cooled them under cold water, cut them lengthwise to thin enough strips and laid them onto a sheet of kitchen paper. I boiled the leaves just long enough to make them tender, cooled them under cold water and spread them on a sheet of kitchen paper. I had cooked a fine ratatouille beforehand, let it cool completely and added a dressing of my making with soft Dijon mustard, tarragon white wine vinegar, walnut oil, pepper and salt. Now vegan and vegetarian friends should proceed directly to the dish I created as the rest ill not suit them! Next I lightly fried small scallops (after marinating then in lemon juice for a couple of minutes) just enough to keep them almost raw inside and put them aside to cool. I did the same, marinade included with some white shrimps. Note: to attain their “standing shape” is very easy. First “peel” them leaving the tail ends for better “handling”, make a shallow cut along their back, take out the innards and fry just enough to cok both sides to a nice color and keep them almost hlf raw inside. This way they will be firm but extremely tender. As for the dish itself, vegan and vegetarian friends can forget the seafood and replace it with more ratatouille and edible flowers for example. I built an “enclosure” with the cut urui stem, filled it with ratatouille. I placed the seafood geomatrically above the ratatouille. 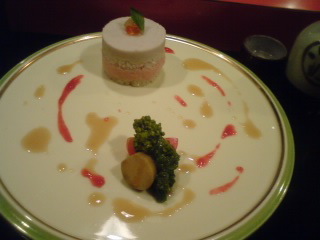 Around it I alternately placed urui leaves, trevise with edible flowers and watercress. Great with a Blanquette de Limoux sparkling wine! Following a few queries about gomadare/seasme dressing I (and the Missus) use a lot, I felt a little information and a simple recipe would come in useful. Gomadare is a great tasty dressing that can be used indifferently with cold dishes as a normal dressing, or in and with hot food, especially nabe/Japanese pot-au-feu, shabu-shabu and any meat or veg actually. First ground together with a pestle the white sesame seeds, soy milk and miso until it has attained a nice smooth consistency. If have difficulty mixing it, heat it a little. Add soy sauce, sugar and ground white sesame to taste. A little experimentation will work wonders. Tip: my favourite dish is to peel ripe figs (see pic), cut them in quarters and pour a generous amount of gomadare over it! The other night, the Missus thought that some healthy food was in order, that is as much for herself as for me, what with her drinking wine and me savouring my Japanese sake! She used already deep-fried tofu cubes called “nama-age” bought at the nearby supermarket, cut them to bite-size, saute them on a non-stick frypan as they were (no need for oil) with a liberal amount of pizza cheese and served them with a good measure of freshly chopped thin leeks. All the while on another pan she fried slightly boiled renkon/lotus roots slices with eringi mushrooms cut lengthwise and half-cut Brussels sprouts with some olive oil, a litle salt, pepper and a spicy seasoning mix. Once ready she added themhot on the same plate. Although I’m neither a vegetarian or vegan, I make a point to introduce anything I discover here which might help friends out! Fukasawa Foods in Shibakawa Cho at the foot of Mount Fuji produces all year round an incredible array of soba/buckwheat noodles, udon/wheat flour noodles, ice-creams, cakes and I don’t know what else. Now, all their food is organic. No artificial fertilizers are used for whatever they grow or buy, and no additives or preservatives are used in any of their product, which means all have to be properly stored and eaten quickly. Vegans will be happy to know they use tofu instead of any dairy product. 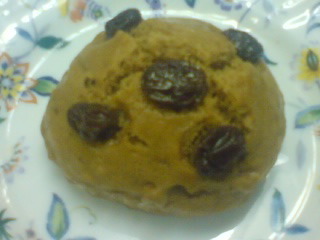 This particular cake called “Mukashi Mushi Pan” or Old-Fashioned Steamed Bread was made with wheat flour, tofu, brown sugar, raisins, salt, vegetable oil. One cake could have easily been held inside your palm, but it was very fulfilling and delicious! They have other varieties made with pumpkin and other vegetables. 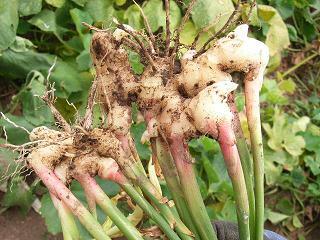 Ginger when eaten outside Japan generally comes under its semi-dry or dry root. 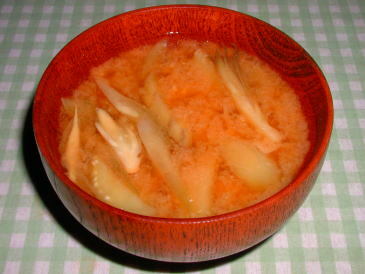 Fresh Ginger pickled in miso. Very practical when you can buy loads in season. Choose your miso paste well so as avoid too much salt! Everyone knows pickled sliced ginger (use fresh plants only!) 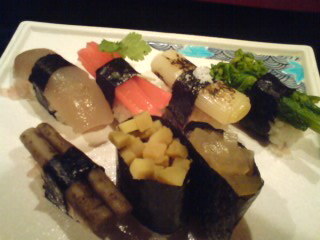 served with sushi! Ginger can be steamed with rice or served very finely cut on top of a bowl of steaming rice! 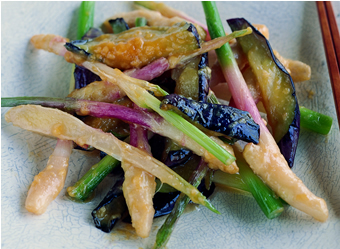 Ginger is great finely chopped and fried with egg-plant/aubergines, soy sauce and mirin! 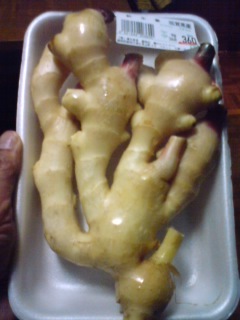 Fresh thin ginger roots are simply beautiful fried/sauteed with othe vegetables! Myōga (茗荷) or myoga ginger (Zingiber mioga, Zingiberaceae) is an herbaceous, deciduous, perennial native to Japan that is grown for its edible flower buds and flavorful shoots. A traditional crop in Japan, myoga has been introduced to cultivation in Australia and New Zealand for export to the Japanese market. I’ve always wondered if it were available on American and European Markets. It is a great plant for use in vegetarian and vegan dishes as it adds lots of soft flavors. 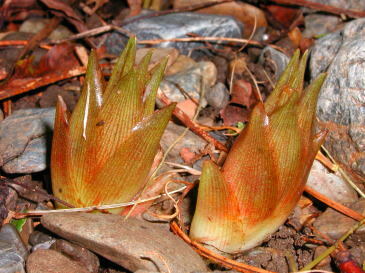 Flower buds are usually found finely shredded raw in Japanese cuisine as a garnish. Actually some Japanese restaurants will prepare the flowers as well as tenpura. Vegans should replace the egg white included in the batter with a little cornstarch. Cut the myoga into thin strips and just add them to the miso soup inside bowls before serving it. 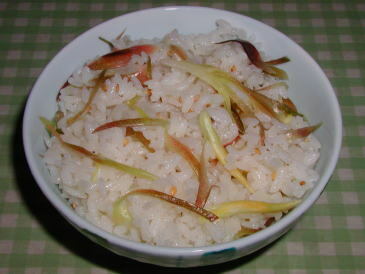 Cut the myoga in very thin strips and put it on top of the rice before steaming it. When the rice is cokked, mix in the myoga with rice and serve. 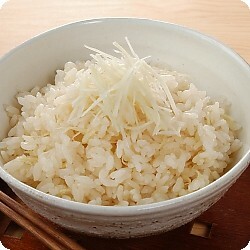 Vegetarians and Vegans may use genmai/whole rice for higher nutritients. Wash myoga quickly under running water. Drain and take excess water with kitchen paper. Best pickled with amazu/sweet rice vinegar. 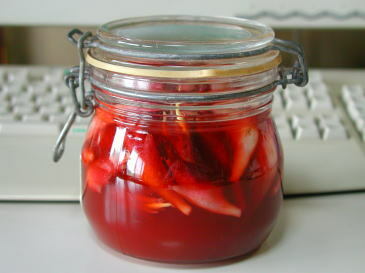 If not available use rice vinegar, sugar and soft umeboshi/Japanese pickled plums. I’ve always been somewhat puzzled to find the word “edamame” in my U.S. (and European) friends’ blogs. 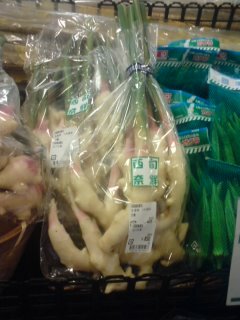 This conspicuous vegetable seems to conjure grand images of Japanese gastronomy in spite of its almost base status in this country. After all, “edamame” (枝豆/branch bean in Japanese) is nothing but green soybeans, a food mass-produced and heavily exported by North American farmers. Or, is it that the soybean’s image has fallen so low on the other side of the Pacific because some people grow it for bio-ethanol that restaurateurs feel more comfortable with a grand-sounding Japanese name? One does not have to boil it, cool it and serve it sprinkled with salt. This is probably the worst and least healthy way to consume it! If you can, choose them fresh on the branch(es). This will guarantee they haven’t lost any of their nutrient qualities. Cut out all the pods and throw away the branches (or re-process them inside your fertilizer box!). Clean the pods under running water. Drain water, but do not wipe them dry. Drop them in an appropriate-sized non-stick pan and hand-rub them in a little coarse salt. The less salt, the better, but enough to season all pods. Experience and personal preferences will tell you how much you need. Cover pan with a glass lid and switch on fire to medium-low. 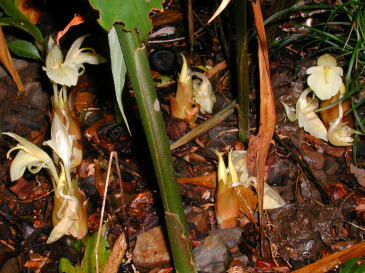 Cook until water seeps out of the pods. Switch off fire and keep inside covered pan (do not take the lid off!) for a good 5 minutes. By then, they should be sufficiently cooked. In Japan there exists another variety called Kuro Edamame/黒枝豆-Black Edamame. Actually they are a light brown-green soybean grown in Shizuoka Prefecture and elsewhere. They are definitely tastier and deserve the title of “delicacy”. The beans out of their pods also make for great addition to salads, artful presentation with meat dishes, and are great mixed inside “nigiri”! It was another one of my quick “evening breaks” this evening, and I just decided to pop up at Yasatei as I knew I would be able to nibble on a great morsel or two. Now, what I ordered should please vegetarians and vegans alike (I’m neither), but I suspect Simaldeff (because of his weight problems). Allison (she loves her veg) and Lindsay (always keen on Healthy food) would particularly be curious to find out what I ate. Well, I ordered “yuuki yasai no sashimi”. “Eshyaletto/Japanese echalottes”, “daidai piman/soft orange pimento”, “myoga/ginger sprouts”, “aka radisyu/red radishes”, “shiso/perilla”, “daikon/Japanese long radish”, and “kyuuri/cucumber”. 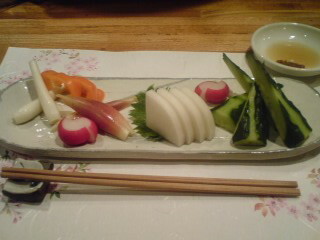 All vegetables, except for the orange soft pimento also have the merit to be grown in Shizoka Prefecture! 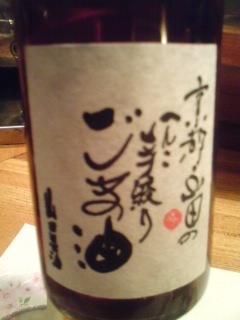 As for “seasoning”, I was offered “goma abura/sesame oil” from Kyoto (see pic) with salt and miso paste. Last night, not only did we enjoy great sashimi ( see earlier article ) at Bu-Ichi, but also savoured some beautiful tempura that would have vegetarinas come running! Served with salt and pepper. No need for sauce! Although I’m not a vegetarian nor a vegan, I do understand the needs of people with different regimen and always try to inform them about gastronomic options available in Japan and Shizuoka Prefecture. Now, sushi for strict vegetarians or vegans exist as sown in those two pictures I took yesterday in a very small but famous Sushi Restaurant called Sushi Iroha in Iwata City, south of Toyoda JR Station. Next I was served a sublime creation concocted with Ebine Imo/Ebine Tuber served mille-feuilles style intersped with sushi rice and presnted with dashes of olive oil, seame oil/goma abura and soy sauce/shoyu. Shizuoka Prefecture is celebrated for its green tea all the World. Vegeterians (and vegans! ), rejoice! 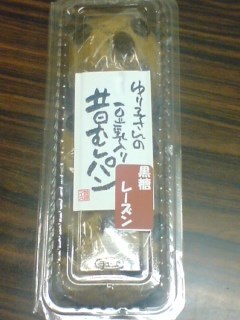 A company called Ikejima Foods in Hamakita Ku, Hamamatsu City has come up with Tea Buckwheat Noodles/Tya-soba!. Tea comes from the Kawane area which produces some of the best tea in the Prefecture. The noodles contain no preservatives and neither the noodles, nor the tsuyu/soup contains any animal extracts whatsoever (no milk or egg products). One pack contains enough for 4 small or 2 medium portions. Dilute tsuyu/soup in 100 ml of clean water. Dilute tsuyu/soup into 230 ml of hot water. Cook noodles as for cold style. Drain and drop into bowl full of tsuyu/soup. Add vegetables, freshly cut raw leeks and spices to taste. Shizuoka has claimed world fame for being the first to grow wasabi in the 17th Century (in yutogi, Shizuoka City exactly) and for producing more than 80% of the wole Japanese output, but people tend to forget that it can be put to many uses apart of using it for sashimi, sushi and the ubuquitous makisushi/rolled sushi! 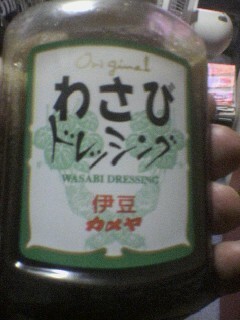 One more great use has been initiated in Mishima City in eastern Shizuoka Prefecture: Wasabi Dressing! It is not at all hot, but almost sweet and makes great accompaniment for any salads, on omelettes (Japanese or traditional) and mixed with sauces. I (and my better/worse) half ae still disovering more usages! Definitely worth a try! Moreover it contains a crowd of healthy ingredients! 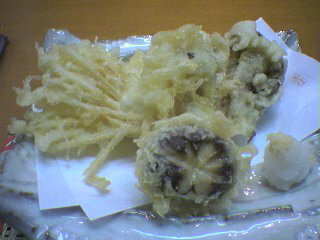 Above is a tenpura made with seasonal mushrooms in Takasagotei Izakaya in Hamamatsu. Actually you could eat almost any edible mushrooms this way! This particular fine (thin) leafy plant is called “Ashitaba”. It is quite common and very cheap in our Prefecture and all over Japan. It just shows how you cantry any leafy plants. There is no limit to it! 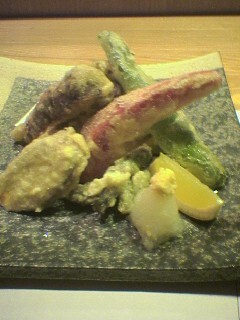 I ordered the above at Oikawa Izakaya in Shizuoka City. 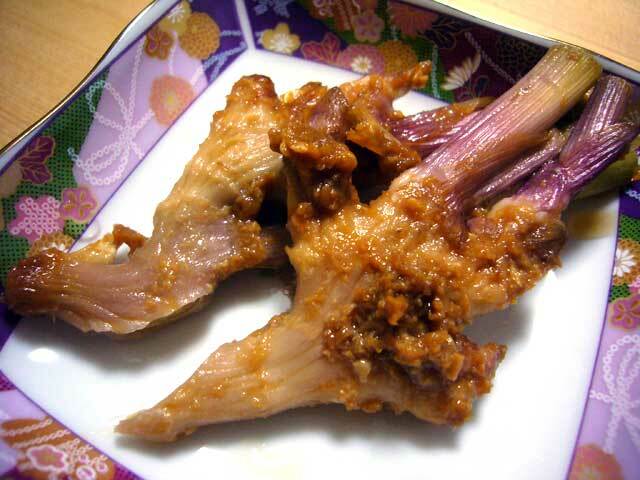 Now, this one is bit more exotic/ethnic as this is kimchee tenpura, which shows that tenpura knows no frontier. Crunchy, it has plenty of texture. Was served at Oikawa Izakaya in Shizuoka City. I heard a lot of vegetarians cmplain about the lack of cuisine and variety in this country. I cannot/may not surmise for the whole of Japan, but I’m certain that Shizuoka Prefecture does not deserve this criticism. It is the largest and most varied poducer of vegetables (and partly of fruit) Prefetcure in the whole country! Now, one way to eat great, tasty and hot vegetarian cuisine (notice I use the word cuisine, not food) is to order vegetable tenpura (“Yasai Tenpura”) in your/his/her favourite restaurants! Good Japanese restaurants and izakaya wil be glad to serve you tenpura made up with only vegetables, like we did last week with Lojol. Ask for “yasai tenpura”. If the chef enquires whether you wish anything else, just say “yasai dake” (“only vegetables”). If he asks you what you would like to eat in particular, reply: “makashimasu!” (“as you see fit!”). I’m certain you will end up with season vegetables only, and if you come back to the same place, the chef will remember you and suggests all kinds of vegetables and combinations! When you mention the word “Souffle”, the first reaction you get is: “Too difficult”. It is actually dead easy, and I can tell you that some restaurants make an enormous profit from them! Butter well the inside of a (possibly round) deep oven dish (about 18cm x 8cm). This will help the souffle rise and prevent it fom sticking. In a large bowl add a little salt to whites and beat until solid. Melt butter completely, pour in flour and mix well with spatula until smooth. Pour in milk and mix well (diffferent people have different techniques, but I found that the best technique is to mix half of the milk little by little first, then pour in the rest and use a whisker to make a smooth sauce). Add salt, pepper and spices. Keep stirring gently. Once the sauce has thickened to the point of almost solid, take off the fire (or switch off the fire). Mix in the egg yolks with a spatula until colour is even. Then proceed the same with the cheese little by little until mixture comes smooth off the spatula. Check that the whites have not gone back to liquid (That happened to me quite a few times, so make sure to check! In such a case, just beat them again. They will go back to a satisfactory state quite fast.). Mix in half first as delicately as possible with a spatula (not a whisker, or you will break the air bubbles in the whites and the souffle will not rise!). Then do the same with the second half. Pour in the mixture in the dish and put in the oven to bake for 45 minutes ( although that depends with every oven). 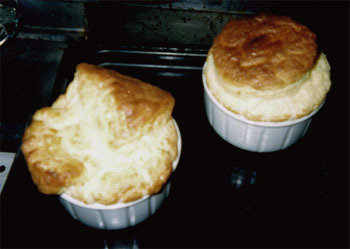 To check whether the souffle is properly cooked, insert a thin wooden stick or knife deep into the souffle. It should come out smooth. NOTES:1) This souffle can be cooked in individual dishes. In that case the cooking time shall be about 30~35 minutes. 2) Instead of cheese you could use tinned tuna (2 x cans), or fresh spinach (one bunch; boil it a couple of minutes in salted water first, then drain thouroughly, and mince it as thinly as possible), or crab (add a little brandy and mix beforehand), or thin short narrow strips of ham, or even ham & cheese. The variations are endless. 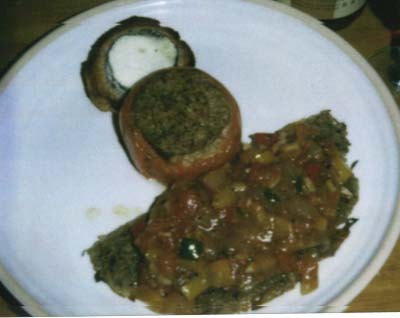 In Summer Ratatouille will please both omnivores and vegetarians as it can be served on its own as it is or as an accompaniment to other foods (see pic above). It can be made in almost any country in the world, but particularly here in Shizuoka Prefecture due to the abundance of great vegetables! Peel and slice the onions, aubergines and courgettes. Cut the tomatoes in pieces. Cit in strips the peppers after ridding them of their seeds. Heat the olive oil in a deep saucepan. Throw in the onions first and one minute later all the vegetables the garlic cloves , the bouquet garni, salt, peppers and spices. Cover and let simmer on small fire for one hour and thirty minutes, mixing now and then to prevent the stew to stick on the bottom of the saucepan. If too much water is rtill left in the stew, half cover halfway. Take garlic and bouquwr garni before serving. NOTES: This the basic recipe. I usually add some tomato puree. The size of the cut vegetables depend on their purpose. The smaller they are cut, the shorter the cooking time. Can be served hot as accompaniment (side dish) or as main course for vegetarians (add chick peas!) or refrigerated as snacks for beer in summer. 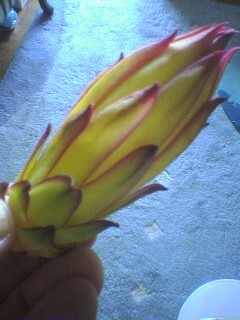 The Missus came back home last night with an unsual “vegetable”: Dragon Fruit Shoots. 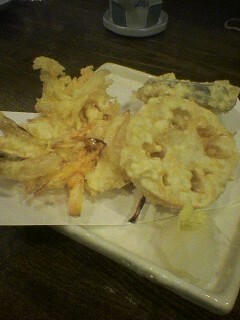 The Japanese have come with the best idea to sample any new vegetable: tempura! Technically speaking it originated in Portugal whose sailors introduced it to Japan a few centuries ago. The word itself is Portuguese. 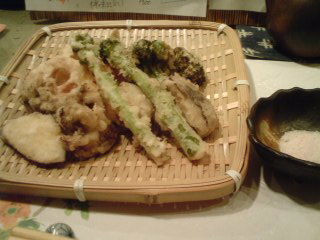 She took the opportunity to add some other tempura made with shrimps and goya. Served with ma-cha tea powder and salt mixed with sakura/cherry blossoms powder, it just turned out perfect with beer and sake! The good thing about my recent trip back home in France is that I have plenty of simple recipes to share! This one was cooked by my father Andre (83! ), and my better (worse?) half can’t refrain from raving about it! Clean and cut zucchini into large chunks. Do not peel skin. Grind into robot or cut/grate very finely. Mix in some salt and pepper. In a large saucepan drop some butter and olive oil and cook on medium fire until very soft. Switch off fire and let completely cool down. In a bowl beat the eggs into an omelette. Pour in and mix fresh cream. Add salt, pepper and nutmeg to taste. Add mashed zucchini and stir well. Coat an oven dish with butter and pour all the zucchini paste. sprinkle with plenty of very fine breadcrumbs. Add parmeggiano cheese if you like it. Cook in oven at 180 Celsius degrees until top has turned a nice brown colour. Can served hot, lukewarm or cold. We are still in mushrooms season, wild ones or cultivated species. Mushrooms are low in calories, but high in quality, whether it concerns taste or nutrients. 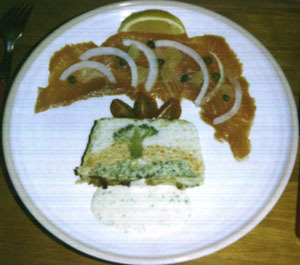 Here is the recipe of a dish my father cooked for us last September back home in France. It can accompany any meat, especially white-flesh meat, or can be appreciated on its own as accompaniment with a sold white wine or heady Japanese sake. On a medium fire in large frypan melt an equal quantity of olive oil and unsalted butter (some people prefer more, some less. Experiment!). Throw in the shallots and garlic and slowly fry until shallots turn transparent. Throw in all the mushrooms and fry untilthey give back enough water. Add Madeira wine. Stir well. Next add fresh cream and stir until cream is perfectly blended. Add salt, peeper and nutmeg last, stir. Check taste and add more spices if needed. Pour the whole in a large dish and sprinkle parsley over the mushrooms before serving. Like souffles, people tend to give up the idea of making terrines or pates a bit too quickly. 2) you can serve a whole party with them. Here is one who will please even vegetarians! Peel carrots and cut into thick slices. Separate stems of cauliflower and brocoli. Steam-cook the whole for 15 minutes. Put some brocoli heads aside for later decoration. Food-process carrots, brocoli and cauliflower into separate bowls. In each bowl add 2 eggs and one third of the cream. Season with salt, white pepper, nutmeg (careful on that one! ), laurel and thyme to taste and mix well. Preheat oven to ( 180 degrees Celsius). Separate leaves of cabbage and dip them for 3 minutes in boiling water and drain thouroughly. In a 2-litre cake mold cover inner surface with cabbage leaves, then pour in cauliflower mixture first. Plant brocoli heads head first, then pour in the carrot mixture and finally the brocoli mixture. Cover top with cabbage leaves. Cook for one hour in oven in bain-marie. Let it cool down before unmolding. Cut in slices lukewarm or cold. Here is a dish for my with a big appetite at Foodhoe, Czeh Absinthe and Jan and some of my friends who appreciate vegetarian food such as Allison! Peel potatoes, rinse and cook for 15 minutes in boiling salted water. Drain and cut in thin slices. Butter the inside of a shallow oven dish (25×3 cm). Preheat oven to 200 Celsius degrees. In a saucepan, on a small fire, melt butter and cook garlic and all herbs gently for a couple of minutes. Add flour and stir until mixture is smooth. Add milk first and mix well with a whisk, then add sour cream and mix again. Mix in salt and spices to taste. Switch off fire and mix in Roquefort cheese as smoothly as possible. Place a first layer of potato slices evenly inside the oven dish. Sprinkle a little salt, pepper and nutmeg. Repeat operation until all potatoes are used up. Pour cheese sauce evenly on top of potatoes and cook for 25 minutes. Serve at once. 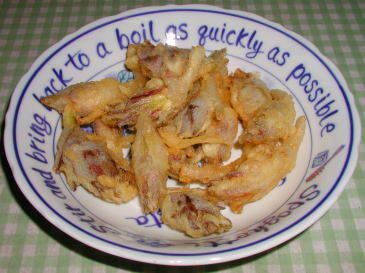 This is also a good snack to accompany a strong beer or cider! Now is the season for Asparaguses, both white and green. Here a traditional French recipe for the green ones. It is not as difficult as the title might suggest! When you choose your asparaguses, check their stems where they have been cut. The more moisture, the less peeling needed! Peel asparaguses from top, cut out the bottom fibery part. Cut the tips and keep them aside. 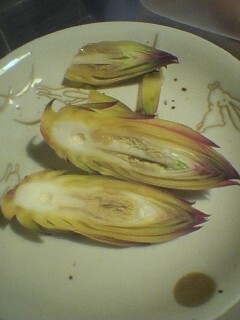 Cut the stems in 1 cm-thick slices and put them in a pot. pour in milk, salt, white pepper and spices to taste. Let cook for 15 minutes. Take away from fire and transfer to food processor. Add a few leaves of trefoil or Italian parsley and process to a fine mash. Preheat oven to 6 (180 degrees Celsius) and put a large dish with water in it to be ready as a bain-marie. 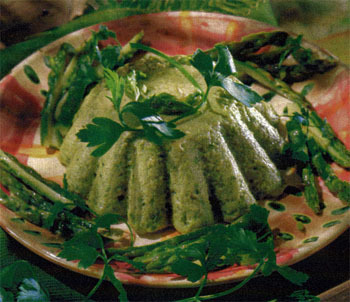 Break the eggs in a large bowl, beat slightly, pour in the asparagus puree and mix. Butter the inside of 4 small oven dishes (ramequin-style), pour in the mixture and cook in bain-marie for 20 minutes. During that time put the asparagus tips in a frying pan, add the rest of the butter, 200cc of water, some salt and let cook for 20 minutes stirring from time to time until there is no more liquid left. When the puddings are cooked, unmold them onto individual plates and decorate with asparagus tips and some trefoil or Italian parsley. wow. glad to stumble on your site. i was able to get a lot of easy vegan recipes i can try out in my kitchen. Tout le plaisir est le mien!